We had a lot of fun at Harry Potter Day! I had signs up with the names and crests of each of the Hogwarts school houses, and everyone got to choose which house they were in; Gryffindor had the most students. As a patron pointed out, you aren’t supposed to choose which house you’re in; the Sorting Hat does that! Sadly, I had no sorting hat, and every “which house are you in?” quiz I could find was online-only, so rather than stress over that, I let everyone pick a house. First thing in the morning, we made Harry Potter snacks (licorice wands, pretzel broomsticks, and butterbeer), and answered trivia questions while we enjoyed eating them. Then, we watched the first Harry Potter movie, while devouring popcorn and lemonade. After that, we made two Harry Potter crafts to take home. 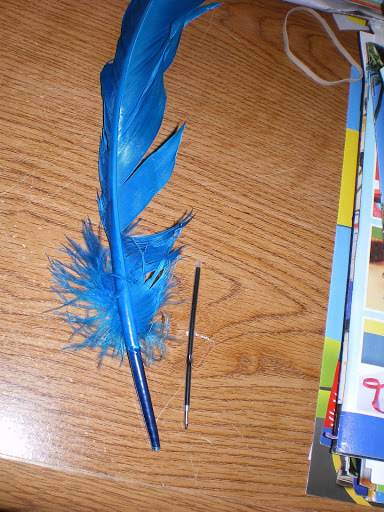 This is the first craft – make your own quill pens! I got the idea from a good friend of mine who is also a librarian, so I can’t take credit for the idea, much as I would like to. It was easy and fun, and the kids loved it. – Feathers – big ones. I got a package of 20 for about $5, and they came in an assortment of rainbow colors. – Pens, preferably clicky ones. I found that the stick pens had nibs that didn’t come apart, where clicky pens had the inky insides that were just a stick with a nib in it, which is exactly what you need here. The first thing you need to do is dissemble the pen and get rid of (or set aside for another use) everything but the ink stick. 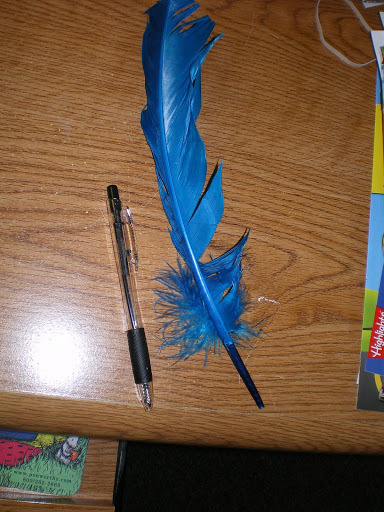 Also, cut the tip off the end of the feather, far enough that you can see the hollowness inside. Lovely! I also cut the pen innards until the plastic was just barely above the ink. We don’t need an inch of hollow plastic. You can see where I’m going with this, I’m sure. 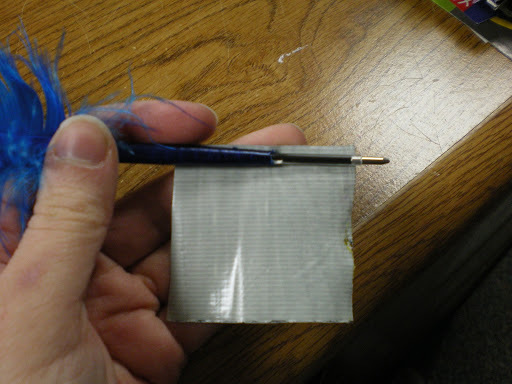 Cut off a piece of duct tape that’s about 2 inches long, and carefully place the pen and feather onto the edge of the tape. 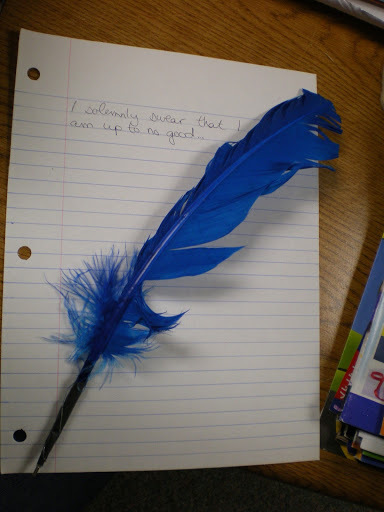 The idea here is to wrap the pen and feather together, so that it stays in place. I used complementary colors (in this case, black tape on a blue feather), but some of the kids preferred to use blue penguin-patterned tape on a yellow feather, or some other highly-visible combination. It’s a matter of preference. And, you’re done! I didn’t have a scroll, so I practiced writing on a blank sheet of notebook paper. It works! Super easy, super cute. I love it. Stay tuned for the second craft of the day. Facebook fans of the library already know what it is!